Is there any working Virtual PC 2007 VM Additions Script available for LiveXP? Edited by M. Safdar, 26 July 2011 - 05:41 PM. I think to remember that there used to be one. It was called 'virtual machine additions' but it only worked partially. Yes, I have found a script xVPE VirtualPC 07 V14.script by Max_Real_Qnx. But it is working partially. mouse is not working. If anyone knows a Working script. Please post. There used to be an older one too. It was for the older VirtualPC and was meant for PE1 projects. However mouse integration didn't work in that eighter. If you want or need integration fully working, i'm afraid, you'll have to have a look at the other VM, like VirtualBox or VMWare. Maybe you get lucky with one of them. In my initial stages of creating LiveXP and testing it in Virtual PC, I found a Plugin for Bart's PE Builder. It was created by Paul Larini (mustang) From Virtual Machine 2004 Additions for Windows XP. That Plugin worked best. I converted the plugin to script using Winbuilder80 and a little modifications like file paths. Again the result is same, mouse is working partially. What could be wrong? Edited by M. Safdar, 26 July 2011 - 07:31 PM. The problem will surely have something to do with the fact that LiveXP is smaller, than a XPE-BartPE. Eighter there are some files missing or a service or maybe just a problem with the registry. XPE-BartPE was created with the intend to create a PE as close as possible to a real XP. LiveXP, despite it's name, had never that goal. It was actually a few times seriously scaled down in abilities, because the maintainers at the time felt, that a rescue system like LiveXP should have no fluff. Bottom line, if you want or need a PE1 that's as full featured as possible, a XPE-BartPE is still your best bet. As the development on XPE-BartPE is nearly closed. Bart has not updated his PEBuilder for a long time. Last Version 3.1.10a (released on Feb 17, 2006) and also Sherpya has stopped further releases of XPE plugin. So I came to know about WinBuilder. It is much feature rich than PEBuilder. So I am trying to run WinBuilder builds in Virtual PC. I will appreciate if anyone could help in this regard. Yes, Winbuilder is newer and has many nice features BartPE didn't have. But if you stick to XP based builds, the old BartPE + XPE create still a more perfect PE. Newer means just that, newer. Not better! Somehow people seem to have a hard time, with that concept. Wonko, al_jo the problem is not to run VPC in LiveXP, but to have the VPC Addition working in a LiveXP, which is run in VPC. But running a LiveXP iso in VirtualBox or VirtualPC has never been any problems here. M. Safdar, wants the VPC Additions working. Things like drag and drop, mouse pointer integration, filesharing. This would actually be pretty useful during development. I thought the question was about VM additions added to the whatever is run inside Virtual PC running inside LiveXP. The question is about having the VM additions added to the LiveXP running INSIDE the Virtual PC, right? If so, you are right , since AFAIK Virtual PC does NOT offer ANY advantage over Virtualbox or VMware, using one of them instead could be a solution. But do any of these give the same "integration"? Back to VPC, it seems like the actual mouse driver is a plain enough driver, at least having a glance at msvmmouf.inf. Mouse IS working concerning LiveXP in VB & VPC. I do not know if they give all the same features. But at least VMWare knows filesharing and mouse pointer integration. So i assume VirtualBox will probably too. Mouse pointer integration means, the VPC window can be treated just like any other program window. No click required to capture the pointer, no press of a special button, to release it again. I have no idea, how this is acomplished and if simply installing the mouse driver would do the trick. But since M. Safdar has a problem with the script, as well as with a ported BartPE plugin, i think it might not be so easy. msvmmouf.SvcDesc	= "Virtual Machine Additions Mouse Integration Filter Driver"
msvmmouf.MediaDesc	= "Virtual Machine Additions"
that somehow "exchanges" info with the "outer OS" running VPC. Yes, al_jo, mouse work in Virtual PC running LiveXP.ISO. But the pointer is trapped inside VPC window. the only way to release mouse pointer from VPC is to press Ctrl+Alt+Del which opens Host OS Task Manager. By closing Task manager you are back in Normal Windows (Host OS). With the addition of VM Additions script in LiveXP Build. this problem is gone. the mouse seamlessly integrate in VPC and there is no need to press Ctrl+Alt+Del. The problems is I used scripts xVPE VirtualPC 07 V14.script by Max_Real_Qnx http://maxrealqnx.boot-land.net/ which is basically written for VistaPE and it worked in Win7PE_SE too. By this script mouse partially worked and did not pass clicks to Guest OS, I mean LiveXP in VPC. Another script I tried was converted from PartPE Plugin. 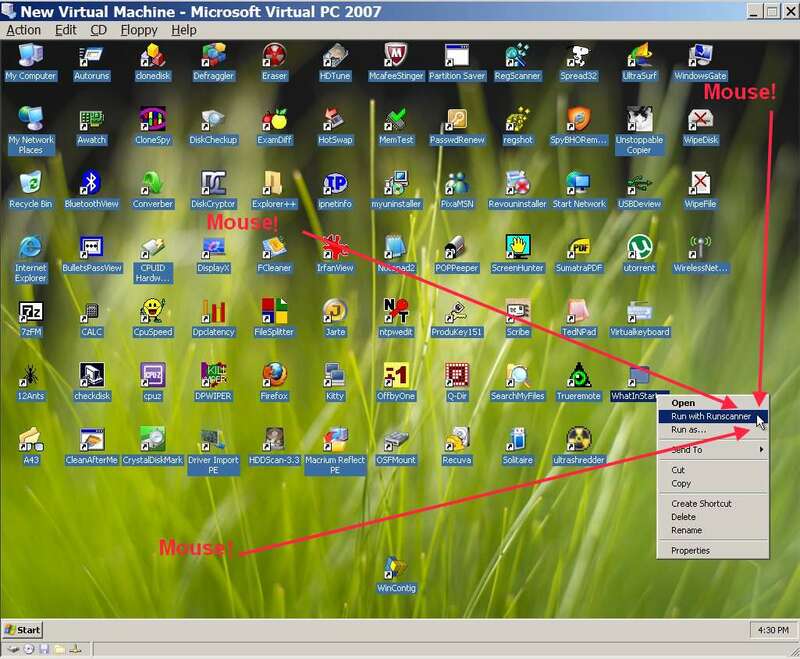 It was created by Paul Larini (mustang) From Virtual Machine 2004 Additions for Windows XP. That Plugin worked best in BartPE . I converted the plugin to script using Winbuilder80 and a little modifications like file paths. Again the result is same, mouse is not working. I am posting both scripts for your study and suggestions. My goal is to add this feature to LiveXP. how to attach script files in posts, by the way. But capturing mouse here is not "Ctrl+Alt+Del", it's "AltGr". and provide the link after. I second that. "AltGr" is the default key for VPC to release the mouse. Using options, it can also be set to any other key, one likes better. If the "Ctrl+Alt+Del" thing is the only reason for needing additions, just setting an easier key or key combination, should suffice. I know that, but the script should work. "the only way to release mouse pointer from VPC is to press Ctrl+Alt+Del"
Anyway...where is the scripts so somebody can have look?